Jacob George, on the Katy Trail in Hartsburg, en route to Chicago. George served three tours in Afghanistan between 2000 and 2004. But it was years later that he started speaking out (and bicycling) against the war. "When I got back, I was a pretty shattered person. I was a homeless drunken disaster for about two years straight, trying to put my life back together." In 2010, George's brother, Jordan, got orders to ship out to Afghanistan. "It really just hit me in the gut. Like this thing has gone an entire generation. I did my first tour when I was 19, at the beginning of this war. Here we are nine years later and my younger brother is about to go through the same thing. And that really charged me up." Jordan decided to go AWOL, in protest of the war. "So we hopped on bicycle to ride across the South and share our story with people. Because it's a story that many people understand and experience in the South: family member being sent after family member." Now Jordan has settled down with a good job at home in Arkansas, but Jacob is still on the road. Sometimes he rides with ten or fifteen others. 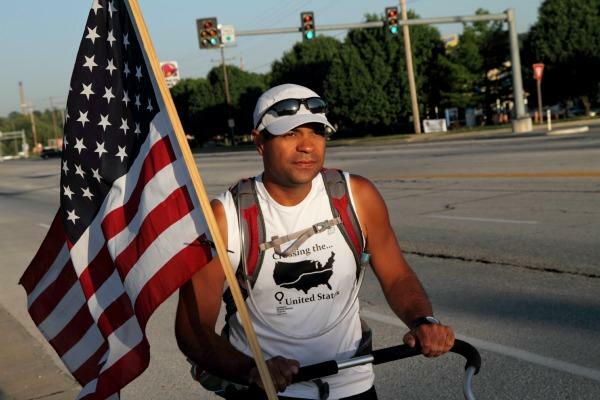 But right now, he's on his own as he rides to Chicago to protest the NATO summit. They call the group A Ride Till the End. George rides with a banjo on the back of his bike, and others often come with instruments too. "Most of our travel and work is done in the South, and most of us are Southerners, and we understand how important it is to use music to bridge that political gap."